There’s a garnish trick I’ve been wanting to try for a while, and I finally got around to doing it today. It worked fantastically well, and gave me a very attractive rose made out of tomato. First, start with a tomato. I used cherry tomatoes in this experiment, but I imagine a full sized tomato would work as well. Starting at the top, use a sharp knife to cut around the entire sphere in one continuous peel. You should end up with a single long peel and a very juicy tomato inside. You don’t need the entire outside for it to work, but it should be as thin as possible and not very wide, either. 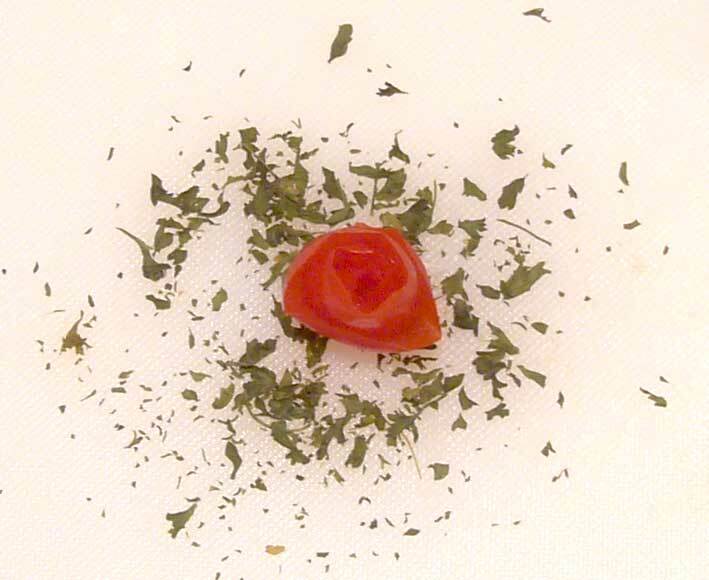 Once you have separated your long skin from the tomato, roll it up. It won’t roll evenly, or even look right at first. Don’t despair. Turn it over. If it still looks odd, turn it over again. You want the outside roll to have the inside facing up like a rose does. Sometimes it works, sometimes it doesn’t. My first try produced the best rose, but my second was mediocre. The third was good, and the fourth was intercepted by my mouth before it was finished.